Those methods may be well adapted for some types of industrial applications. However, they are undesirable for the medical operations. Therefore, the company ISIS was looking for a new balancing system for its manipulator SurgiScope (Fig. 1) and started a partnership with the INSA of Rennes. The SurgiScope is a based on a Delta robot and is designed in order to carry out a microscope system with a weight of 70 kg. In the case of the SurgiScope typical applications, the displacement speed of the platform is not essential because there is no need for productivity acceleration. However, as a result of the increased mass of the platform (about 70kg), the input torques became important. Thus it became evident that the platform’s mass must be balanced. In this case, the traditional approaches with counterweights and springs mounted on the moving links are not applicable. The Delta robot has a complex structure and after such balancing it becomes either very heavy or a complicated assembly with several complementary articulated dyads. That is why another means for the solution of this problem is proposed. Fig. 1. SurgiScope robot sold by the company ISIS. The gravity balancing of the SurgiScope was the topic of the thesis of Cédric Baradat, but I also worked in collaboration with him on the modelling of the balancing system. It consists in the addition of a secondary mechanism between the manipulator base and moving platform. 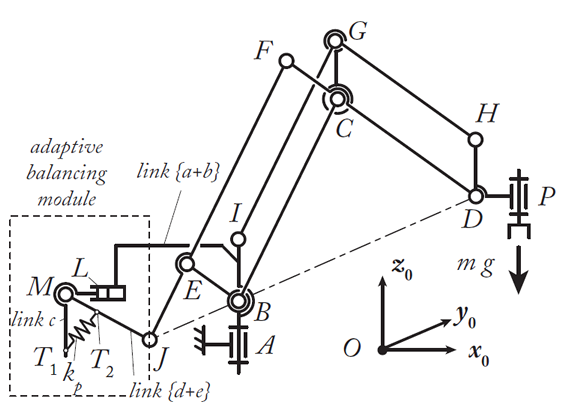 This mechanism, based on a passivepantograph linkage, can create a supplementary vertical forceon the platform to balance the gravitational forces of the robot (Fig. 2). Experimental results have shown that it was possible to reduce the input torques up to 80% (Fig. 3). Moreover, the auxiliary balancing system has a good influence on the robot deformations which can be reduced by 80%. C. Baradat, V. Arakelian, S. Briot and S. Guégan, "Design and Prototyping of a New Balancing Mechanism for Spatial Parallel Manipulators," ASME, Journal of Mechanical Design, 2008, Vol. 130, No. 7. S. Briot, C. Baradat, S. Guégan, and V. Arakelian, "Contribution to the Improvement of the Medical Device SurgiScope®," Proceedings of the 2007 ASME International Design Engineering Technical Conferences (DETC 2007), 4-7 septembre, 2007, Las Vegas, Nevada, USA. The use of active counterweights, where the position of the counterweights on the balanced links varies and is modified through the use of additional actuators. This leads to the increase of the number of actuators and, obviously, to the development of a more complex controller. The use of linear springs that changes their equilibrium position. This also leads to the considerable increase of the number of actuators and the achievement of more complex controllers. The use of remote counterweights connected to the robot via a hydraulic transmission. The main drawbacks of this technique is the use of hydraulic power systems (while the robot energy is provided by electricity) and the increase of the system footprint. An additional drawback of all these techniques is the following. When the payload is changing from a mass m1 to a mass m2, there is a change of potential energy in the system equal to V = g z (m2 − m1) (where g is the gravitational constant and z the altitude at which the load is changed). Therefore, if m2 > m1, energy must be brought in the system to be able to adapt and to compensate the new payload. If m2 < m1, if the robot was ideal, it should be able to stock the non necessary energy in capacitors or batteries. However, even if most robot actuators are now equipped with four-quadrant amplifiers which are able to stock additional energy in capacitors, as the stocking performance of capacitors is limited, many energy is still dissipated (under the form of heat) to avoid the overload of the capacitors. Thus, all existing adaptive gravity-compensation systems of robots are not energy efficient. I am currently developping a balancing technique allowing to overpass all these drawbacks (Fig. 4). The new balancing scheme allows for the compensation of the gravity effects of the manipulated payload which may vary. Contrary to most of gravity balancing techniques able to compensate the gravity effects of variable loads, this compensation module is energy efficient, i.e. the adaption to the new manipulated payload does not require to bring energy inside the system. Fig. 4. The robot with the adaptive balancing module and a payload mass m: the P joints at points K and N are fixed while the others joints of the adaptive module are passive. S. Briot and V. Arakelian, "A New Energy-free Gravity-compensation Adaptive System for Balancing of 4-DOF Robot Manipulators with Variable Payloads," Proceedings of the Fourteenth International Federation for the Promotion of Mechanism and Machine Science World Congress (2015 IFToMM World Congress), October 25-30, 2015, Taipei, Taiwan. Parallel robots have been widely studied and optimized in terms of kinematic and kinetostatic behavior, but, due to their high complexity of their dynamic model, few research works have been devoted to the improvement of their dynamic behavior. The shaking force and shaking moment balancing consists of the cancellation of the ground reaction transmitted by the moving robot to its frame. This topic has been fewly developed due to the problem difficulty. However, high shaking force and shaking moment lead to the structure vibrations and, as a result, to the loss of positioning accuracy. Shaking and shaking moment balanced mechanisms are appealing for a large amount of applications, such as spatial robotics, because they allows the avoidance of the use of trajectory compensation techniques for spatial devices due to the motion of the robot, which allows energy gains. Many techniques for shaking force and shaking moment balancing have been developped for 1 DOF mechanisms. However, as soon as the number of DOF is higher, the proposed solutions are missing of interest due to their high complexity (increase of the design complexity, of the robot mass and of the input efforts, appearance of backlash due to the use of counter-rotations, etc.). The proposition of new solutions for the shaking force and shaking moments of robot is thus of great interest. S. Briot, V. Arakelian and J.P. Le Baron, "Shaking Force Minimization of High-Speed Robots via Centre of Mass Acceleration Control," Mechanism and Machine Theory, 2012, Vol. 57, pp. 1-12. S. Briot and V. Arakelian, "Complete Shaking Force and Shaking Moment Balancing of In-line Four-bar Linkages by adding a Class-two RRR or RRP Assur Group," Mechanism and Machine Theory, 2012, Vol. 57, pp. 13-26. 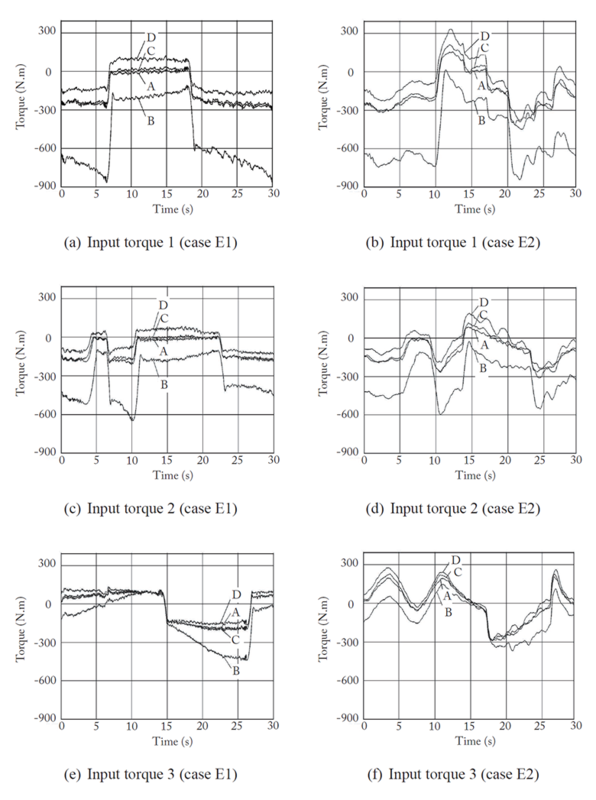 V. Arakelian and S. Briot, "Simultaneous Inertia Force/Moment Balancing and Torque Compensation of Slider-Crank Mechanisms," Mechanics Research Communications, 2010, Vol. 37, No. 2, pp. 265-269. S. Briot, I.A. Bonev, C.M. Gosselin, and V. Arakelian, "Complete Shaking Force and Shaking Moment Balancing of Planar Parallel Manipulators with Prismatic Pairs," Journal of Multibody Dynamics, 2009, Vol. 223, No. 1, pp. 43-52. S. Briot, V. Arakelian, N. Sauvestre and J.-P. Le Baron, "Shaking Forces Minimization of High-Speed Robots via an Optimal Motion Planning," Proceedings of the 18th CISM-IFToMM Symposium on Robot Design, Dynamics, and Control (ROMANSY 2010), 5-7 juillet, 2010, Udine, Italie. S. Briot and V. Arakelian, "Complete Shaking Force and Shaking Moment Balancing of the Position-Orientation Decoupled PAMINSA Manipulator," IEEE/ ASME International Conference on Advanced Intelligent Mechatronics (AIM2009), 14-17 juillet, 2009, Singapour. V. Arakelian and S. Briot, "Dynamic Balancing of the SCARA robot," Proceedings of 17th CISM-IFToMM Symposium on Robot Design, Dynamics, and Control (RoManSy 2008), 5-9 juillet, 2008, Tokyo, Japon.